No matter how many times I look back at the events of the last few days I still can’t make any sense of it. All I know is that my dearest cat, Dickens, is gone. How could I have been in a veterinarian’s office just three days ago, thinking all Dickens needed was a change in his thyroid meds, and by the following evening he would be gone? How could he have had cancer throughout his body and no one knew? Dickens had been on a weight loss plan for several years, as I slowly brought him down from 23 pounds to 14 pounds. A visit to the vet 6 weeks ago confirmed he was ok and could even lose another pound. A month later I was back at the vet’s office because Dickens didn’t look well and I knew something was wrong. Blood tests showed he had a high thyroid and two weeks ago he was started on meds for that. He didn’t tolerate the meds well, even after switching to the gel form. Within a few days he was depressed and lethargic. Still thinking it was the meds, I went to speak with a cat specialist three days ago about the radioactive iodine therapy for high thyroid. Instead, I was sent to an emergency hospital where Dickens was immediately put on IVs and oxygen. Tests showed he had cancer throughout his abdomen and organs. There was nothing that could be done. I brought him home for a few hours to say goodbye to his three sisters and the only home he had ever known. Then I brought him back to the hospital and said my own goodbye to this dearest and most wonderful friend. Dickens had a large presence. He filled our home with his mischievous nature and dedication to living a curious and joyous life. His loss has left a huge hole in my world. I don’t know if I should walk around that hole or jump into it. Perhaps I’ll just sit at the edge and dangle my feet in the void, and pray that I feel some whiskers on my toes. I am lost without you, my sweet boy. Not seeing your black paws sticking out from under my clothes in the closet last night reduced me to a flood of tears. Not seeing you on the hamper this morning while I dried my hair left me shaking. Not having you join me at the table for breakfast told me this was all really happening. Your impish spirit and magical heart will be with me forever. I promise to watch over your three sisters, although no one could take care of us as well as you did. We are lost without you, sweetie, and the road ahead looks awfully dark and lonely. I will be forever grateful that Jake found you and your sisters under the deck, and that I had the privilege of sharing my life with you for the last 12 years. I know Jake was waiting for you, and you are now flying through the heavens together. Never forget how much I loved you, Dickens. And if you’re ever in the neighborhood, please stop by…there will always be a can of whipped cream in the fridge, just for you. Chris – I’m so sorry to hear your sad news. Losing a beloved pet is one of the most difficult things. Take good care of yourself as you go through this difficult time. And know that there are many people sending loving thoughts to you. Chris, I can hardly see for my tears. A big personality, a big surprise, a big loss, I will really be sending you light and love in the next days. I was just thinking about my four who will soon turn three, and comparing it to your four, thinking how wonderful it was for you that you still had all of them. Please write about Dickens when you are ready. He sounds like a personality I’d love to know. All of us here send you our sympathy. Dear Chris, Dickens was blessed to have such a wonderful and loving mama as you. I’m so sorry to hear that he has left this world leaving a very sad and lonely place in your heart. I recently lost my dearest feline soul mate, Hattie. I ache for her black paws wrapped around my neck at night but her beautiful and impish little soul will always be with me. Dickens (along with Jake) is scampering about happily, just out of sight but he will always know your love and will always be entwined in a special place, just a heart beat away. I’m thinking about you and sending warm hugs and purrs. Thank you all very much for your loving thoughts and healing hugs – it means so much to me. I know you understand what I am going through. 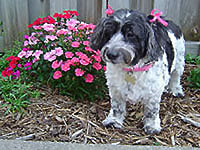 Susan, I’m so sorry for the loss of Hattie – sounds like you know all about missing those black paws! Dickens will always be my boy, and we WILL be together again…someday. We are so sorry that Dickens had to leave you. That certainly was a wonderful post in tribute to him. He sounds like a super wonderful cat and will be truly missed. It is hard to put things into words and I guess the best thing is to send you tons and tons of hugs. We also send many purrs, woofs, Heehaws and a baa. We are all thinking about you. Oh Chris, my heart sank. Selfishly, I was reliving the loss of Creepy Boy…though I was not blessed to have him or his sisters during those very short 5 years. There are no words. 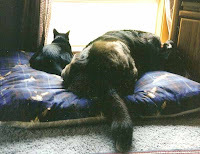 Your heartfelt writing is always an inspiration of true love; for our beloved furry friends. We are so lucky, to have in our lives these wondrous creatures while we walk among many human souls on our earth who never offer a moment of acceptance and love to the animals who keep us sane, and filled with sighs and joy. Thank you for sharing Dickens with all of us. Myself and my boys send you strength and await your next ‘find’ as there are others who still need your love and grace. We don’t know each other, but I read about this on the CWA listserv. I’m very sorry. We lost my little black cat Mocha in 1999. It still seems like yesterday and I still miss her. It is very difficult to lose our pets, as they are part of the family. 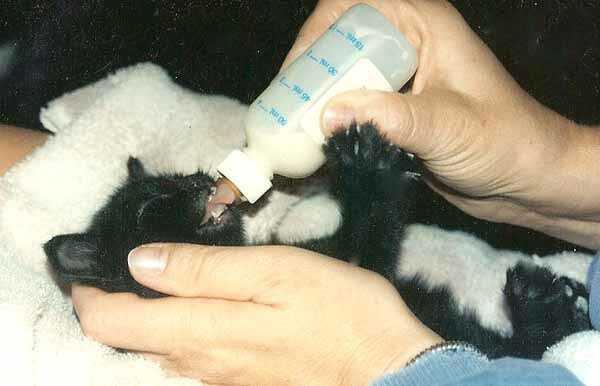 Another little black one, Marie, came into our lives in 2000 at Christmas. She is very special. I hope that, when the grief passes, you find another special one to go with your other cats. 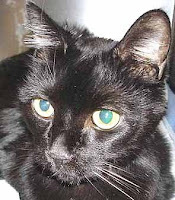 John, it sounds like you’ve had the pleasure of being captivated by black kitties, too – they are so special! One of Dickens’ three sisters is a black cat – her name is Star, and she truly shines. I hope Marie will be with you for many more happy years. Chris, I’m waving to Dickens at the bridge. You’ve written a lovely tribute. Dear Chris, A couple of days ago I visited your blog for the first time and read your story about Dickens. I so fully felt your pain, having been there too. Losing a beloved pet is so hard when we feel and know that they are so extraordinary and our relationship with them is so powerfully profound. We know that this experience is very rare and a gift of the highest order. While we know that we will be forever connected to them, the loss of their physical day-to-day presence is excruciatingly hard to bear. The healing journey, though necessary, is so difficult and must be guided by a trust that the empty space will be filled some day by another being. I still remember the incredible shock of hearing that my beloved Eca was ill with cancer and so I know the sound of that thunder-clap when you were told that Dickens was filled with cancer. When I lost Eca, the pain was overwhelming – but in time, when I was ready, Thunder came into my life and became my close and constant companion. I know that Eca brought him to me and I can’t think of Thunder without thinking of Eca. I no longer mourn for Eca because Thunder embodies her spirit as well as his own, he so completely fills me up with his love and depth of devotion and this has helped me come to terms with the loss of one that I once could not imagine living without. Each person’s and each animal’s journey is unique, and I know my experience is not the same as yours – and yet we share a deep connection with our animals and both the joy and pain that can bring us. The intense pain that we feel when we lose that special pet is unfortunately the price we pay for the intense joy of sharing that special bond. I hope your healing journey is a gentle one – my thoughts are with you. Oh, Bob, what beautiful words. It seems like just yesterday that we spoke about Eca – where have the years gone? The shock of losing my sweet Dickens out of the blue was very hard, but more and more I believe this is exactly how he would have wanted to go -quickly and with little pain, living a normal life until his last few hours. Dickens has let me know he’s at peace now, and in that I am finding my own peace. Please give Thunder a hug from, ok?